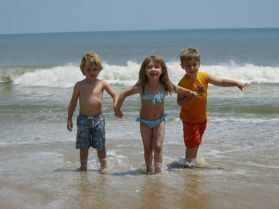 The beauty of Duck, NC is that the re are so many things to do and most all of them are within walking distance! The village layout of Duck makes it easy and enjoyable to explore the town on foot or by bike. Stroll into town to shop or to get a bite to eat. Stop by one of the fresh fruit and vegetable stands to pick up something for dinner. Be sure to take in a breathtaking sunset over the Currituck Sound. The casual coastal vibe of Duck is sure to relax and rejuvinate! Some Duck vacationers bring bikes from home, but most prefer to rent from local outdoor stores and rental shops. You will even see folks riding around on bicycles built for two! Just be careful to look out for traffic and pedestrians. 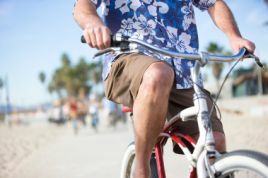 Biking around Duck Village is a fun and environmentally friendly option, but be sure to stay safe. Water sports are extremely popular in Duck, NC. Surfing, kayaking and paddle boarding lessons and rentals are readily available throughout Duck Village. Jet ski rentals and parasailing adventures can also be found. Surf and sound fishing are also favorite activities for active Duck vacationers. Need a break from the sun and surf? Browse through Duck's boutiques, gift shops, galleries, surf shops, book stores, toy shops, and more. You’ll also find a selection of wonderful Duck restaurants, from ice cream shops to award-winning fine dining. 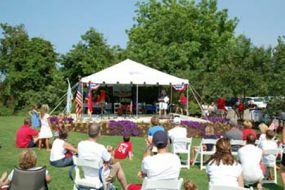 The Town of Duck offers an array of fun activities and events, such as the Summer Music Series, Pilates and tai chi on the lawn, Children’s Story Time, a July 4th parade, and the annual Jazz Festival. Duck, NC is located within a quick and scenic drive of other Outer Banks attractions such as the Whalehead Club and the Wright Brothers Memorial. However, the delightful village ambience will be tough to leave! While on your Duck vacation, be sure to check out these local activities and attractions! US Army Corps of Engineers Field Research Facility. The Duck Research Pier is located just north of Duck. Tours are available during the summer months. This fascinating tour is well worth the time away from the beach! Duck Town Park Enjoy walking trails, a public canoe/kayak launch, picnic shelter, playground and boardwalk. This lovely and well-maintained community recreation area is located in the heart of Duck Village. Town of Duck Summer Music Series. For 6 weeks during the summer, local music groups take the stage at the town gazebo on Tuesday and Thursday evenings. You'll hear everything from acoustic rock, to bluegrass, to jazz at these fun and free events. Duck Waterfront Shops. Explore 15 speciality shops directly located on the Currituck Sound. You'll find everything from books, to toys, to jewelry to souvenirs in one charming spot. Independence Day Parade.The Town of Duck is one of the only on the Outer Banks to hold an annual Independence Day Parade. Vacationers and residents are encouraged to participate. After the parade, the town has live music and a social at the Duck Town Green. Check out the video below to see what the Town of Duck Independence Day Parade is all about. Faire Days Festival. Every Wednesday afternoon this summer from 2 pm to 7 pm, (June 13 - August 29) at Scarbourough Faire, come shop and enjoy family fun throughout. Story Hour, Play Doh Coloring Sheets, Live Horses, Jugglers, Clowns, Magicians, Book Signings, Live Music, Segway Demos and more! Duck Jazz Festival. Since 2006, the Town of Duck has held their annual Duck Jazz Festival at the Duck Town Park in October. The free, all-day event showcases national, regional and local Jazz recording artists for residents and vacationers. A series of events is also planned throughout the Town for the festival weekend.